– Windows 10 is available in 2 editions; Desktop and Mobile (and really several other versions for Hololens, IoT devices, etc. – but we are only concerned with the 2 that can run Office apps). – Windows 10 desktop is for Intel-based computers and can run Office Win32 apps and the new Universal apps. – Windows 10 Mobile is for ARM-based mobile devices (phones and tablets) and can only run Universal apps. – Desktop apps are the traditional “full” application and only run on full power (Intel) computer devices. – Desktop apps are available in 32-bit and 64-bit versions. – Desktop apps can install 3rd party add-ins. – Desktop apps can run in a window of any size (or multiple side-by-side). – Desktop apps are named just the app name; PowerPoint, Word, Excel, etc. – Universal apps are a new build option. 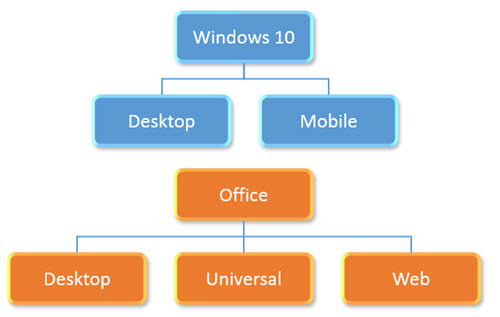 – Universal apps can be installed on both the Windows 10 Desktop and Windows Mobile operating systems. – Universal apps are available through the Windows Store, as individual apps (there is no single install that includes all Office apps). – Universal apps run in full screen mode only (eg. the application fills the entire screen, so no task bar or other apps until it is minimized or closed). On Windows 10 Desktop, they have “mobile” in the app name; PowerPoint Mobile, Word Mobile, Excel Mobile, etc. On Windows 10 Mobile they have just the app name; PowerPoint, Word, Excel, etc. – Web apps are separate from Desktop and Universal apps. – Web apps do not require installation, which allows them to work on both desktop and mobile devices. The main recap is that today there are a lot more options available than in the past. The good news is, virtually every computing device and platform is covered for Office/PowerPoint. The bad news is that every option has slightly different capabilities and limitations. Things are filled with different frustrations today, and tomorrow we will have different frustrations – but solving those frustrations for our wonderful clients is what keeps us busy! Microsoft has a lot of new versions of apps released or in beta. 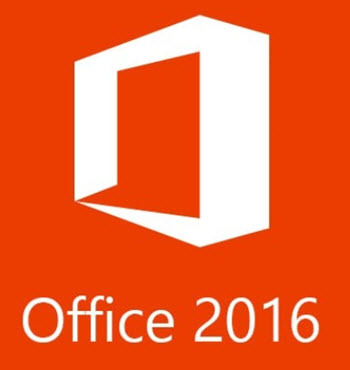 The new Office 2016 (for Windows, not to be confused with the recently released Mac version) is getting close. The PowerPoint team at Microsoft has put together a blog post that lists off most of the updates to the 2016 version. Take a look at what is coming our soon here. Note: When you open a .potx, it automatically creates a .pptx presentation file. 9. Use the Resize option without losing template formatting! 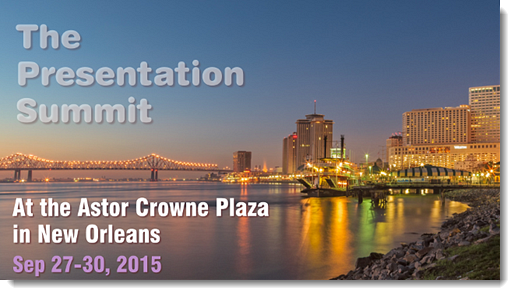 The previous post showed how template formatting is often stripped out of a presentation when it is resized. So here is my simple, non-tech description of what is happening inside PowerPoint (Note: If you really want details on templates and themes, I highly recommend Echo Swinford and Julie Terberg’s excellent book: Building PowerPoint Templates Step by Step with the Experts). 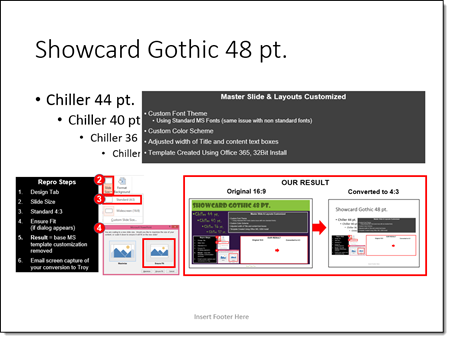 The resize “bug by design” will only happen with presentations and templates developed in PowerPoint 2013 and above. 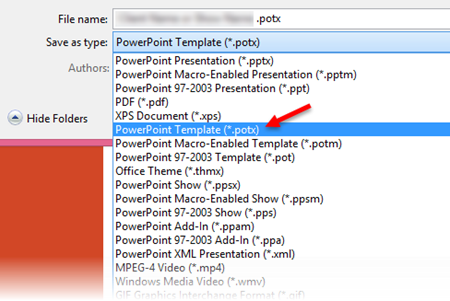 Files created in PPT 2007 and 2010, even if edited in 2013, do not have the resize issue because those versions of PowerPoint do not have the troublemaking feature. 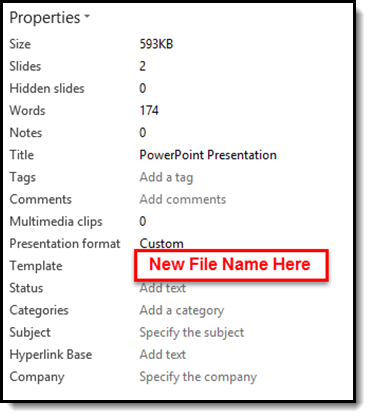 With PowerPoint 2013, a new option for templates was added, VARIANTS. Variants will eventually be a great feature, but currently they are not really used and the “Super Theme Templates” they open the door to create are so difficult to develop, I only know a few designers in the world who really understand them and are willing to tackle them (and I am not one of them). Variants, which you see in the Ribbon on the Design Tab, are basically template styling options. When resizing slides, PowerPoint needs to use a variant. 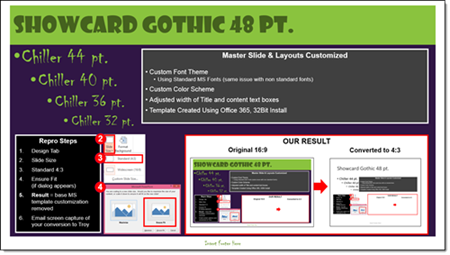 If there is not a custom variant already there from a Theme, PowerPoint reapplies the Microsoft Default Theme. 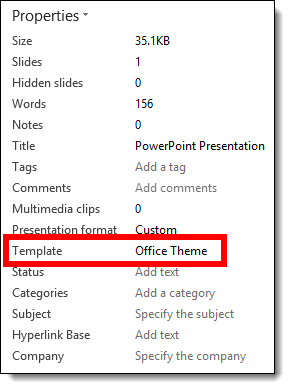 The default theme, called “Office Theme,” is what you get when opening a new blank presentation (boring, white, no stylized formatting). When the default theme, and its variants, are applied, all formatting to the master slide and layouts are replaced with this “default” setup. What this means is nicely designed slides lose their existing template styling attributes. See the previous post for a downloadable sample slide you can test and see formatting stripped. 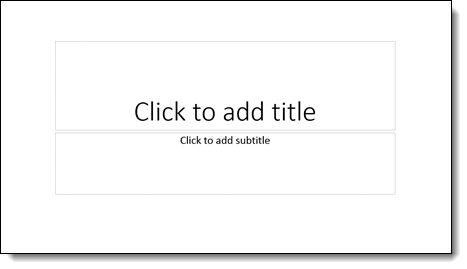 The next post, part 3, is a step-by-step solution to avoid PowerPoint adversely affecting slides when resized. Here is the scenario: you have a 16×9 presentation that needs to be changed to 4×3. Easy! PowerPoint has a great feature to change the aspect ratio (via Page Setup) and it keeps everything proportional (eg. circles stay round) and adjusts the position of everything to fit the new slide layout – but things don’t go as smoothly as planned. – Correct page size – yay! Part 2 and 3 of this series detail what is happening behind the scenes in PowerPoint and a (fairly) simple step-by-step solution. Here at TLC, our team works hand in hand with companies dealing with all sorts of information. One week, you may find us setting up show computers for a large event for a pharma company, and the next week, onsite running presentations for an executive of an auto corporation. Our computers are always operated by internal staff, but it is imperative to secure information. Dropping files into the Recycle Bin is not really deleting them – it is only the operating system removing the reference of the files from the system table. Every file is really there until another file is saved over it. 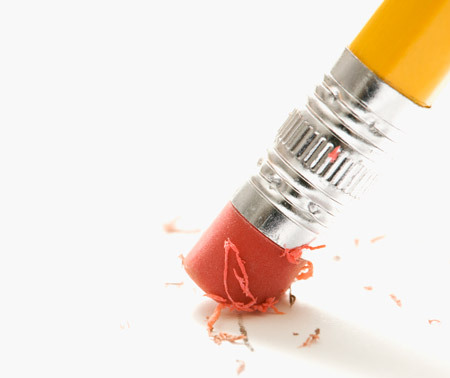 Eraser permanently overwrites files with patterns of data that completely prevents file recovery. So, whether you want to securely erase financial records, passwords and/or security data, Eraser is a free, easy to use program that makes files gone for good. Eraser can be found here (go to the download link at top of page – do not use any of the adware download buttons!). Everyone knows a few ways to advance to the next slide. Everyone seems to use different options (none are wrong). Here is a quick list of the 7 most common slide advance options.